Containing carefully selected Central American and African beans that have been roasted together to produce a rich and smooth coffee. This blend offers a wide flavour profile that works perfectly in any drink, including cappuccinos, lattes, espressos and much more. The blend is mixed prior to the roasting process, producing a consistent medium roast evident in every bean. The addition of African coffee in this blend gives a bright acidity that is perfect as an espresso – hence the name! With a sweet aftertaste, it is simply irresistible. 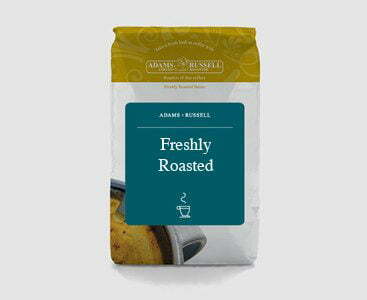 100% Arabica beans ensures your coffee is at the highest quality, and when you buy from Adams + Russell, they’re always flame roasted, hand packed and delivered fresh! Coffee quality can depend on humidity, temperature, elevation, soil quality, rainfall and much more. Certain parts of Africa produce very high-quality beans because of these attributes, however it does depend on the region. Liberica – Usually grown in the Western parts of Africa, mainly in Liberia. The taste is similar to Robusta. Sadamo – A type of Arabica that is described as rich, spicy and chocolatey. Arabica – A high quality coffee that is usually grown in mountainous areas. Robusta – The African environment is perfect for growing Robusta which is why such a high volume of it is produced here. Excelsea – Grown on very tall trees and has similar characteristics to Liberica. Kouilou and Petit Indenize – Grown along the Ivory Coast on small trees. Bourbon – Planted in the 18th century on an island off the Eastern coast of Madagascar. Mayaguez – A type of Bourbon grown in Rwanda. We have done some research and found a delicious African coffee cake recipe where this espresso blend can be used. You can find more African recipes on our Jamaican Blue Mountain Blogpost. This one is from JamaFo and we have converted the American units for you. Nice strong taste but very little bitterness. Mellow after taste which lingers. Very good crema head on making in a bean to cup machine. Seemed lacking in flavour and a bit bland for us. The Classico blend is the best coffee we have had so it had a high bench mark to beat.